This server has received 2229333 hits from both ipv4 and ipv6. 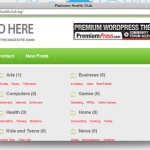 The WordPress.org website includes an online directory of thousands of completely free themes. WordPress insists on GPL licensing which also means these themes are free to modify to your own custom design if you wish. 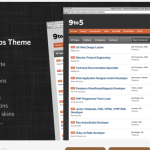 There are also many many sites offering paid for themes. The quality is generally high and if you are after something that gives your site instant wow appeal, it can be worth spending a few pounds on a theme. Expect to pay USD $35- USD $95 (GBP £20 – GBP £60) for a theme. This post is about WordPress themes that do more than just change the appearance of your site. We’re looking at themes that include specific functionality. This often means the theme comes with extra plugins to perform these roles. 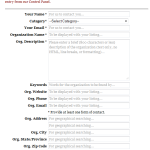 The DirectoryPress WordPress theme is a complete theme and plugin. Cost is USD $79. The theme includes maps, payment gateways for paid directory listings and around 20 different template designs. Business Directory for WordPress is a plugin only. It allows simple text based listing, submitted by the unregistered users. There’s no editing facility. Cost is free although a suggested donation of USD $5 is requested by the author to help fund further development. 9-to-5 theme. 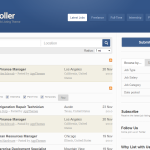 This theme from a paid theme provider costs USD $35 and includes both a job board theme and the listing plugins. Features include ajax filtering, google maps, and the ability to take payments via paypal for paid listings. Jobroller is another paid theme. It includes separate portals & tools for both job seekers and employers, has built-in payment gateway support and a has a CV section. Cost is USD $99. Job Manager is a plugin only. It’s designed for a single company’s job listing and includes functions to take online applications and manage the interview process. It’s free and has been downloaded over 30,000 times from WordPress. Sofa OpnPress is a paid theme that styles itself “WP Yellow Pages”. It offers front-end editing for users, paid or free listings mode, a voting system, and supports localisation. Cost is USD $35. Another WordPress Classifieds Plugin is a well established free plugin (2 years old) and boasts upwards of 70,000 downloads from WordPress. It allows for paid or free ads, moderation, notifications and social integration. A number of premium (paid-for) modules are available which add things like featured listings, fee per category and google checkout integration. wp-classified is a simpler option that adds a simple information & advertising blackboard or classified page in to your wordpress site. The plugin is free. A few comments in the forum indicate that some users find the documentation lacking. Agency Theme is a paid theme that includes a nice “donation bar” on the home page. Ideal for fund raising towards a target, the donation bar shows progress towards the specified amount features a prominent donation link. Cost of this theme is USD $95. A number of plugins that offer a similar feature can be found on WordPress. 10 themes for non-profits. Not a theme or plugin itself, this post reviews 10 beautiful themes designed with charity websites in mind. Donate Plus is a free WordPress plugin with PayPal integration. The plugin contains lots of options for creating a donation form on your site, and includes a recognition function for displaying donations and comments. In function it’s similar to Just Giving, though does not include any Gift Aid functionality. We’ve chosen just 4 categories here but there are dozens if not hundreds of customised themes and plugins for just about any specific function you might care to imagine (let us know in the comments). Costings shown above were correct at the time of writing but are likely to change in the medium-long term. Sometimes you may need to pay for the feature you want, but compared to the cost of bespoke development it’s likely to a be fraction of the cost. Many of the developers actively encourage customisation work so even if the plugin or theme doesn’t do quite what you want, it’s very well worth contacting the provider to ask if they will make a change for you. 2020Media is an established UK hosting provider. We offer WordPress hosting with expert technical assistance. Our service includes free migration from other hosts or WordPress.com and plenty of free help getting your site up and running. Hosting plans start at £45+vat/year. http://jetpack.me/. Back in March, WordPress launched Jetpack, a plug-in that brings features from WordPress.com to WordPress.org users. The aim is to have no trade-off between the .com and .org versions. In a sentence, it’s a collection of useful plugins. I can see that the Business Directory would be good if I ever ported my Aficionado website to wordpress. Will finish other projects first though. wowwww nice infor thanks friend.